Still searching for the perfect anti-frizz product for your hair? Living Proof No-Frizz Instant De-Frizzer is once that should definitely be on your radar for summer. 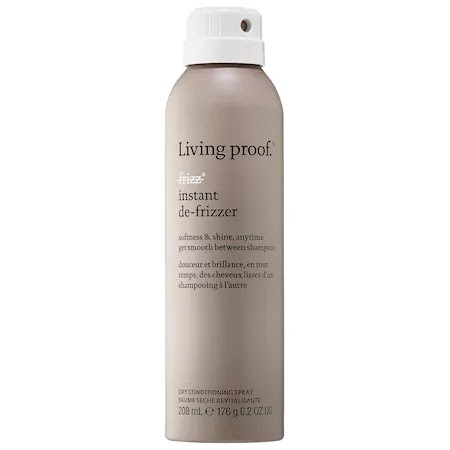 Living Proof No-Frizz Instant De-Frizzer is unique in that it's not a serum based or pre-shampoo/ or pre-blowout liquid product designed to tame frizz. This is a product that is used as a style finisher, as well as a hair touch up product during the day. Instant De-Frizzer was formulated to bring hair back to a smooth, frizz-free state. it provides UV protection and restores natural oils for softness, smoothness, and healthy-looking shine—without residue or buildup. I loved that Living Proof No-Frizz Instant De-Frizzer didn't weigh my hair down, gave it instant shine and dried quickly to allow me to brush/style my hair any way I wanted. Instant De-Frizzer works well on any type of hair prone to frizz, especially curly/coily, wavy, and relaxed hair. Instant De-Frizzer did live up to it's name, taking any puffiness away instantly, and giving me a much smoother and shinier appearance within seconds. Instant De-Frizzer didn't give me hair buildup or a sticky feeling. I tested Instant De-Frizzer on some very humid days and usually just two touch ups were needed (but this will vary depending on how thick your hair is and your hair type). All in all I was amazed by how well this product worked on my relaxed hair, as well as my little one's long, thick curly hair.